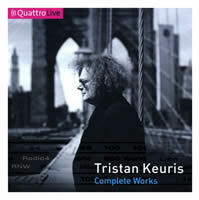 Tristan KEURIS: Complete works. Var. performers. Challenge Records Int. 75939 (11 CDs, 1 DVD) (http://www.challenge.nl/). Distributed in the US by Allegro Music (http://www.allegro-music.com/). A complete works edition sparks the hunt for a clearly defined arc of maturation. At 11 discs with 51 works, Keuris’ legacy can’t be comprehended in one hour let alone an afternoon. The few compositions I heard previously (Emergo EC 3940-2 with the Second Violin Concerto and the Symphony in D) induced a mild impression, and their composer went onto a list of folks worth getting to know better. I tackled this brick as if it were a detective novel, wondering how it would all end. Tristan Keuris (1946-96) occupied that cluttered landscape between Modernism and Romanticism. His style is not easy to pin. The perhaps oddly named Choral Music 1 for orchestra (1969; Netherlands Radio Chamber Philharmonic under Henrik Schaefer) marries terse Webern with punchy Stravinsky. We never learn whether the 22-year-old planned a Choral Music 2 to follow these six short movements. Other early efforts, such as the 1970 Piano Sonata (René Eckhardt), reflect their era. As the decade progressed, Keuris revisited tonality, embracing a restrained lyricism akin to Bartók. Keuris appears to revel in a set of chords and intervals which in the right light suggest Messiaen’s rosiness. There are even lush, Mahlerian canvasses such as the Three Michelangelo Songs (1989-90; mezzo Jard van Nes supported by Lucas Vis and Het Gelders Orkest). I wanted to draw conclusions about Keuris’ preference for homogeneous textures. His output includes two string quartets (1982, 1985), a clarinet quartet (1983), a saxophone quartet (1986), Five Pieces for brass quintet (1988), a recorder quartet (1990), and a dense string sextet (1994). However, I found that unusual instrumental combinations were handled more inventively, even capriciously, such as the Eight Miniatures (1980) for clarinet, mandolin, guitar, marimba, viola and double bass written for the newly minted Nieuw Ensemble with Otto Ketting. The Clarinet Quintet (1988; George Pieterson, clarinet, with the Orlando Quartet) is more vibrant than either the four-clarinet opus or the two string quartets. Despite two violin concertos (1984, 1995) and a chocolaty double concerto for cellos (1991-92; Ralph Kirshbaum and Gregor Horsch backed by the Netherlands Radio Symphony under Pascal Rophé), Keuris was more fluent with winds than strings. The 1978 Capriccio for 12 winds and double bass (Netherlands Radio Chamber Philharmonic and Hans Leenders) offers taut variety, and the nine-player wind Intermezzi (1989; Wind Ensemble of The Hague Philharmonic under Wim Roerade) reveals a wide emotional breadth. I lost my way in the two violin concertos (Joan Berkhemer with Elgar Howarth leading the Netherlands Radio Philharmonic, and Yayoi Toda with Peter Eötvös and the Netherlands Radio Chamber Orchestra). Voices enter late in Keuris’ world. To Brooklyn Bridge (1987-88, with Hart Crane’s text) might lead the composer’s hit parade. It would appear to be the motto for this collection given that the cover photo features the composer on the famous span. Nearly 25 minutes long, it’s scored for 24 voices and an ensemble of four clarinets, four saxophones (homogeneous quartets again! ), two pianos, two harps and three double-basses (Anne Manson leads The Hague Philharmonic, Netherlands Chamber Choir and Aurelia Saxophone Quartet). Keuris’ longest composition would be Laudi (1992-93), “a symphony for mezzo-soprano, baritone, two mixed choirs and orchestra,” on Gabriele D’Annunzio’s texts (David Porcelijn commands Jard van Nes, mezzo, David Pittman-Jennings, baritone, John-Edward Kelly, saxophone, and the Netherlands Radio Philharmonic Orchestra and Chorus). As with the Michelangelo songs, Mahler and Britten are not far removed. The final I Pastori with sighing horns and slow pace is eminently Der Abschiedish. Among orchestral works, Antologia (1990-91; David Robertson and the Royal Concertgebouw) impresses with a Boulezian fluidity and ripeness. Indeed two collections, Three Preludes (1993-94; Royal Concertgebouw and Riccardo Chailly) and Arcade, “six more preludes for orchestra” (1995; David Porcelijn with the Netherlands Radio Philharmonic), impress mightily, wherein a single line is adeptly carried across the orchestra. I think we hear Keuris’ true voice in these nine miniatures, stark contrast to the last concertos, for organ (1992-93), the second for violin (1995) and a chamber concerto for accordion (1995). The second violin concerto’s slow movement bluntly echoes Berg, Piazzolla clearly influenced the accordion concerto, yet Bartók provides the most insistent gravitational pull. A thick booklet provides multi-lingual notes (Dutch, English and Spanish!) which consider each work in turn. Unfortunately the overall package is light on biography and each piece’s discussion is topical. Eleven discs could reveal a trajectory, but there are few clues as to the works’ personal significance, the composer’s intentions, or other hints that might sketch a trend or highlight developments. This means we take the music as it comes. Keuris’ legacy is certainly secure in the Netherlands, and these performances which range from radio archives to productions mounted expressly for this collection appear to be definitive. Should one prefer modest doses, single Keuris items appear on a few anthologies. I’d like to see the orchestral preludes collected together. There are few portrait discs in print. The Lagos Ensemble with guest violist Kyra Philippi offers an inexplicably dreary First String Quartet alongside Kagel’s Fourth on Turtle Records TR 75531. The included DVD offers Fred van Dijk’s 1994 film, To Brooklyn Bridge, with footage of the bridge and environs over Keuris’ score.